Judging from the duress and anxiety associated with money, few people are aware of its real purpose and function. 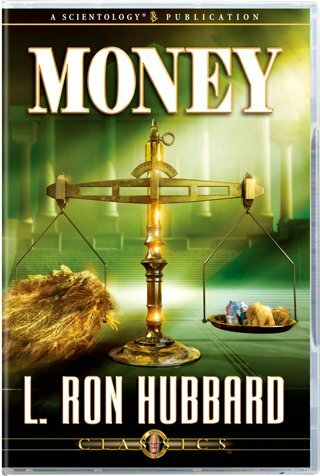 As L. Ron Hubbard delineates its proper role in assisting the survival of individuals, groups and cultures, what becomes clear is that money owes its unsavory reputation not to its use, but to its abuse. Here, then, is an entirely new look, demystifying a subject and commodity that everyone depends upon. And as for what follows from that, listen and see. It is the thing everybody is after. If you didn’t have something that everybody was after, then you wouldn’t have any game. Money is, of course, something with which everyone is familiar. But how many people truly understand the role money plays in the society? Judging from the duress and anxiety associated with this subject, few people are aware of the real purpose and function of money. Here Mr. Hubbard delineates its proper role in assisting the survival of individuals, groups and cultures. As he strips away the complexities accumulated over the centuries to prevent anyone outside an “inner sanctum” from really grasping its purpose and function, the entire subject clarifies and focuses. And what becomes clear is that money owes its unsavory reputation not to its use, but to its abuse. Once understood for what it is, money assumes its correct place as but one element—albeit an important one—contributing to individual, organizational and national survival. Here, then, is an entirely new look, demystifying a subject and commodity that everyone depends upon. And as for what follows from that, listen and see.